Kari Smiraglia, a senior fashion design major in the Department of Design in the College of Visual and Performing Arts, was named the grand prize winner of the 2013 Design-a-Throw competition sponsored by Monterey Mills, one of the nation’s premier suppliers of knitted pile fabrics. The award was announced in a press conference at SU on March 4. Senior Amanda Martinez received third place; Iwa Mo Ng, also a senior, was named a finalist. Both are fashion design majors. Sponsored by Monterey Mills’ Denali Home Collection and Designathrow.com, 182 students from across the country participated in the unique opportunity to design a throw to be added to Denali’s 2015 collection. Fashion design seniors Iwa Mo Ng, Kari Smiraglia and Amanda Martinez (l-r) pose with Monterey Mills President and CEO Daniel Sinykin and Smiraglia’s grand-prize-winning design. Sinykin said that the company is already working on the patterns submitted. The Fall 2014 Design-a-Throw Contest theme, also announced March 4, is college themed. 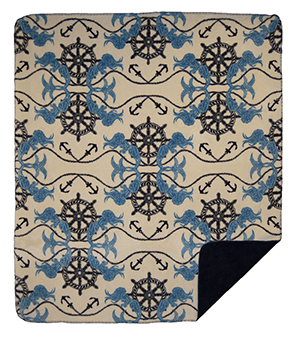 More information on the 2013 winners, and the 2014 competition, can be found at http://www.designathrow.com.